Destination Dallas is a non-TNNA trade show held each year in Dallas, Texas. In 2018 the show will be September 15-17, with some classes on 9/14 I think. The newest items I find will be at the top of the list starting July 1st. Browse Facebook postings of more than one photograph using the right and left side arrows. Items listed below have been announced but won't be available until after Destination Dallas. Stitch By Stitch Larchmont has a Pinterest page with photos of new canvases. They don't have a lot of information available when it comes to size or price, just the photo and a short designer name. You can see their "board" by clicking on the link below even if you do not have a Pinterest account. Just look for "Continue Without Account" at the bottom of the window that opens asking you to log in or set up an account. Click on it and you are free to browse this page. Pocket Full of Stitches shows off the new canvases they picked out in Dallas on their blog. Stitch By Stitch in Larchment, NY is doing a two-part summary about what they saw in Dallas. Homestead Needle Arts is posting their new designs from Dallas on their website. Sheena shows off new canvases at Louise's Needlework and also her favorites from Dallas. Fiber Talk interviews Debbie Woodard of Painted Pony and one of the founders of Destination Dallas. Louise's Needlepoint shows off new items they picked up in Dallas in their newsletter. To close out 2018, we have a fabulous new rabbit design from Elizabeth Foster at Melissa Shirley Designs. Needlework Retailer shows off the new "Eggplant Flowers' Challah cover from Janice Gaynor. Are you from Chicago? You might want to check out this Annie Lane exclusive for The Classic Stitch. A. Bradley has six new "safari" mitten designs for the wild animal lover. Stephanie Booth has new pet bowls in two sides—3 and 4 inches in diameter. She's working with a designer to create canvases to go with the bowls. The canvases are inserted in the base and covered with a "lid" so it can come out for cleaning. They are washable but not in the dishwasher. Needlework Retailer shows off the new wine bags from Point2Pointe. "Colorflutter" is Sally Corey's latest stash buster design. Tapestry Fair is re-introducing the Ann Spiess Mills Nativity set. Rainbow Gallery has 9 new colors in their Silk Lame Braid line, mostly blues with some purples. Terry Dryden's newest chart is called "Vintage Log Cabin" and it will be available in January, 2019. Lee has a new luggage tag in orange with an alligator pattern. This makes 8 colors in their self-finishing luggage tags. Laura Perin has a new Christmas tree/Bargello design, all in traditional reds and greens with gold metallic and beads for sparkle. David McCaskill has a new Christmas design for 2019. It has LED lights for the candles! New from Mary Tussey—a Christmas-themed Cheers. Nancy's Designs has four new charts out. Use the right side arrow to see them all. Judy Keenan NeedleArts has new animal canvases (including several dog breeds and birds) on her Facebook page. Sandy Arthur has a new Etsy shop. It's where she sells extra books, painted canvas overstock from her classes, and odds and ends. Have fun browsing! Machelle Somerville Designs has new cosmetic bag designs. A new canvas for coffee lovers from Thorn Alexander. Terry Dryden shows off her latest design which will be available after Christmas 2018. Treenway Silks has two new shades of fuchsia—beautiful! And More is partnering with a woodworker in NC to bring stitchers the "Ultimate Laying Tool". Most are made of ipe wood although some appear to have a Best Laying Tool inserted into a wooden handle. Susan Johnson of SJ Designs has a new booklet out—Charted Patterns of the German Renaissance. It's a reprint of a 1859 pattern book. Attention shops--Works by ABC charts are now available via Hoffman! Colour Complements has new colors of overdyed Petite Very Velvet in stock. Laura Perin has a new star quilt design! It's called "Autumn Stars" and it is beautiful. New Christmas ornaments from Cindy at Barbara's Needlepoint. Hingham Square Needlepoint has a new beach flag. Enriched Stitch shows off the new Christmas ornament from VNG. New abstract animal from Michelle Prince. 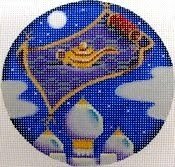 There is a stitch guide from Enriched Stitch. 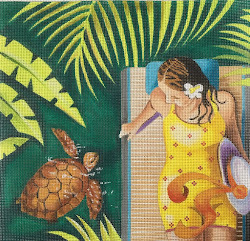 Michele London Price has a brand new "Sand Dollar" beach design, available from NeedlePOINT of LaJolla. New from Charley Harper/Meredith Collection—"Isle Royale." Sally Corey shows off her new "Color Waves." Barbara's Needlepoint shows off Christmas designs by their in-house artist Beth. Shareese has a lovely exclusive stitching peacock ornament for Peacock Alley! Ruth Schmuff shows off Brooke Connor's newest, "Long Bird Short." Enriched Stitch shows off Melissa Prince's new (in 2019) "Paint the Town Pink." Tapestry Fair shows off their new "Turkey Blessings" design, shown in a custom service tray from Deux Bijoux Bijoux. Enriched Stitch has a new patchwork heart design for their annual Go Red with Thread heart disease fund raiser. Earlier years' projects are still available as well. Orna Willis has a new design in the Shields of Life series-"Freedom." Right now it is available in kit form. All you need to supply is the canvas. Barbara's Needlepoint has a new tartan deer from Ann Hanson. Ann Hanson will do tartan buffalo and moose designs, too. Mindy has new "Minis" with matching leather wallets. New from Ewe and Eye—snowman and his bunny. Here is the newest from Annie Lane—"Our Home Town" which is the 4th of July parade. New and fun animal designs from Tapestry Fair. Griffin Designs is new and has a lot of fun small pieces for the holidays. Sally Corey shows off a new design from her VARNA series. Ruth Schmuf just announced Daid Galchutt's "Feline Fiesta" now comes in a smaller size. Laurel Wheeler has a new blue meditation piece that is gorgeous! Ruth Schmuff just announced that Lulu My Pink Turtle have six new cat canvases. They are similar except for color and dress pattern. Fun! Laura Perin has a new entry in her long panel series. It's called "Sand and Sea Panel." And it is lovely but that goes without saying. New from JP Needlepoint—"House on the Hill." Tapestry Fair has a new black cat for Halloween. Here's the new Teresa Kogut "Halloween House" from for Love You More. Penny MacLeod shows off two new heart designs, two new stars, and a new person. Use the right side arrow to see everything. The newest Melissa Prince design is "Paint the Town Pink." It's for breast cancer survivors and a portion of the proceeds will go to help fund research. Glorifilia shows off their new "Flamingos" design, which is a companion to their "Swans." Denice DeRusha Designs has a new Texas fair ornament. Pepperberry has new small "Crazy Daisy" coasters, sized to fit into the Tilly Thomas self-finishing coaster sets. Eye Candy shows off the Halloween version of her new "Cats Tooth" design. Kangaroo Paw Designs has a new series called Itty Bitties. Lorraine from Colour Complements shows off three new colorways, all based in olive. Colour Complements has a new kit that has threads and a Sue Dulle design included that uses the new color schemes, too. Love You More has new garden (and garden gnome) yoga canvases. Barbara's Needlepoint shows off the available Ann Hanson Limited Edition Santas on their Facebook page. The 2018 one will be revealed shortly. Here's a new bunny slipper Christmas snowman from Love You More. Janice Gaynor/Fleur de Paris has a new floral—"Peony in Purple." New cat and dog designs from Jody Valentine! Here is the newest Kreink color-"Sea Glass." Lovely! DebBee's Designs shows off four new small designs. The Needle Bug shows off their new Camilla Moss canvases. Blue Dogwood shows off "Clematis" the first of three cyber designs that coordinate. Accoutrement Designs has a new fun Halloween magnet—a ghost bursting out of a haunted house. Limited edition Kelmscott "Tudor Rose Primitive" scissors from are available at Bits and Bobs. Rebecca Wood has updated her website with the newest things! Amy Bunger's shop newsletter shows off new products, new threads and thread colors, etc. A new cowboy Santa by Julia and Mickey Snyder! The latest from Little Bird Designs are based on her grandfather's artworks. Two Sisters has three new colorways of their striped palm pattern. Jody Valentine has new checkerboard letters and new dog bone designs. Treenway Silks has two new shades of fuchsia. New from Annie Lane—"Irish Wool." Enriched Stitch shows off their rooms in Dallas (VNG and Amanda Lawford designs) and talks about the Local Needlepoint Shop celebration this weekend. Barbara's Needlepoint just posted photos on Facebook of Cindy's newest Halloween designs. And More has added two more sizes of sequins to the 3mm size they have available now. Ada shows off Eye Candy's new "Dark Shadows" collection. Stitches in Time shows off the new designs from Nancy Page Lowenfield available exclusively in the shop (second link below). Pippin has a video that The Needlepointer shot in their hotel display in Dallas. Don't miss the Three Bears in a Hammock! The new stocking cuffs at the very end are going to be wildly popular I bet. BeStitched shows off the new designs they brought home from Dallas. Colour Complements has the flat viscose braided ribbon back in stock. Think Kreinik braid (but in viscose) that was flatted by a steam roller. It's an interesting texture and would be lovely couched. There are five new Alice Peterson "Book Nook" series designs. These are smaller and different versions of the book shelf series that has been so popular. A. Bradley Needle Arts has a new mini sock series called the 50 States Birds and Flowers. You can see the first in the series here. CBK has updated their website with the new designs from their artists. Here's a new design from Ashley Dillon—"Succlulents." Stitch By Stitch is doing blog posts with lots of photos of what they saw in Dallas. Here is the first. DMC is about to release 35 colors of a new six ply floss with metallic woven in. They call it Mouline Etoile. Love You More shows off new designs on Facebook. Use the side arrows to see everything. Kelmscott has a new bat needle minder and new thread keeps. New designs in a video by A Poore Girl Paints. I think the two wedding designs are outstanding! Pewter and Pine posted two photos of their Dallas display. Here are a few new Charley Harper designs from Meredith Collection. The newest book shelf canvas from Alice Peterson is for the sportsman. Puffin has a new metal Ghost Mini Needle Minder. So cute! This is a limited edition one, though, so get your favorite shop to order quickly. Leigh Design's latest are the Sassy Sallys. These are modeled on the real Sally London, the general manager of Rainbow Gallery. Click on the photo to see the models. All have stitch guides. Melissa Prince has updated her website with the latest. New from Daisy Wells! Use the side arrows to see them all. Needlehearts is posting photos of new designs on their Facebook page. Julia Snyder shows off her new Rabbit Box. New designs from Funda Scully. Four new canvases from Labors of Love. Use the side arrow to see them all. Here's a peek at Patricia Sone Designs and Victoria Whitson's Stitching in Style Necklaces. VNG shows off some "remastered" Amanda Lawford and HP designs that will be available shortly. Needle Bug shows off a video of darling new Christmas dog ornaments from Griffin Designs. Oasis Needlepoint shares their new models for Dallas. …plus their new self-finishing coasters. Plus VNG shows off the new Scott Partridge designs. The newest Stitch and Zip canvases are posted by Alice Peterson. SBT Stitches has posted photos of their displays at Dallas. Robbyn's Nest Designs has posted their new items on Facebook. Here's a video of Gone Stitching's display at Destination Dallas with their models, Twinkle threads, their self-finishing tea boxes, stitch guides, their Seven Days of Creation series, their stitch books, and more. Cynthia Thomas has posted photos of her model display. These are things she's done stitch guides for. Tapestry Fair has updated their website with all their newest, including a Nativity set from Ann Spiess Mills and a dimensional cat. BeStitched has updated their website with the newest from Ewe and Eye, Melissa Shirley, EyeCandy and Tapestry Fair. Labors of Love has released a photo of the 2018 limited edition piece. There are only 15 "Josephine" canvases (complete with porcelain faces and arms) available. Vallerie Needlepoint Gallery has updated their website with the newest designs. New birds, new Amanda Lawford, new self finishing coasters with two widths. Brenda Stofft has updated her website with the newest designs. Scroll down to the bottom of the home page. "Keep Talking…I'm Diagnosing You" cracks me up. Melissa Shirley has posted 38 new designs on NP Nation. Enjoy! There's a Brenda Stofft sneak peek on Facebook. Planet Earth Fiber has new self-finishing leather credit card holders. See their ad in the Sept-October NP Now. Devon Nicholson shows off her saddle shoes and a soda in her newest canvas. Ewe and Eye has posted a photo album of new things to their Facebook page. Patti Mann is also doing a sneak peek at all sorts of new things. Sew Much Fun has done a sneak peek of new designs on Facebook. Here's a Melissa Prince sneak peek. Kirk and Bradley will introduce a Dallas travel round at Destination Dallas. Labors of Love has two new small animal canvases, a turtle and an English robbin. Meredith Collection shows off four new Big Buddies needle minders. Tapestry Fair has posted a sneak peak of some of their newest things on their blog. Check their website 9/14 to see it all. Kate Dickerson shows off her newest artist, Kelly Rightsell. Purple Palm shows off another in their licensed Woodstock collection, new at Dallas. Danji has posted a photo album sneak peak of new things on their Facebook page. EyeCandy shows off all the new designs for Dallas. Robbyn's Nest Designs has new hamsa designs and new fleur de leis patterns. Here's a new Jennifer Brinley floral for Maggie. Ada Hayden shows off two new Eye Candy designs. Use the right side arrow to see the other. Jody Valentine has two new "Happy Harvest" designs—a pumpkin and a jack-o-lantern. Plus a pair of classic candy canes! Rachel Donley Needlepoint has this Game Day belt or bracelet ready at Dallas for any team colors. The latest finish-it-yourself item from Point2Pointe are wine glass charms (available in Christmas or a seaside theme) plus a tree to display them on. New from BeStitched, the Lipstick Pin Cushion, a fancier version of the Twister (second link). CBK has a new Texas canvas that'll have you rolling in your cowboy boots. Freda's Fancy Stitching has a new design, their 100th! Love You More offers a sneak peak at "Eve," which is a limited edition canvas. Oasis Needlepoint has a new wedding design with a matching box. 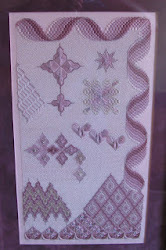 Janet Granger is introducing new needle minders based on her silk gauze sampler designs. Cuter than cute! And if you don't stitch on silk gauze this is a nice way to own one of Janet's miniature samplers. Jean Smith Designs has a new 20 piece vegetable series. Here is "Squash 1." Kate Dickerson has a new cuff or belt "fishnet" design in several colors. Suzie of Enriched Stitch and Vallerie Needlepoint Gallery is packing for Dallas. Labors of Love has a new canvas for your inner party girl. Barbara Elmore shows off Antler with Flowers which is a Sundance model she stitched for Dallas. Vallerie Needlepoint Gallery (VNG) has a sneak peak of some of the 100 new designs for Dallas on their blog. Sew Much Fun has two new drinks canvases (Easter and Hanukkah) for Dallas. Use the right side arrow to see them all. Rebecca Wood has a new Halloween town. The Point of It All has a fabulous fowl in a hat. New from JP Needlepoint, "Never a Dahl Moment." Anther sneak peek, this time Raymond Crawford's "Diamonds are a Girl's Best Friend." Here is a sneak peek of one of Brenda Stofft's new designs. Carol Gantz posted a sneak peak of a bit of a new Associated Talents design on Facebook. Kangaroo Paw Designs has a new police angel. Valerie Needlepoint Gallery (VNG) has a new series called Awareness Hearts, a portion of the proceeds from the sales of which go to various charities. Strictly Christmas has finally added a dozen new stocking cuffs to their line. They are called Stuffed Cuffs because they have so much detail. Bohin has new scissor style called "Ladies and Lace" available in various colors. CBK shows off Loira Manne's "Merangel" canvas, new at Destination Dallas. Pewter and Pine is going to adapt Christie Denizo's Spirit Animals art to needlepoint. ThreadworX has four new colors in their Legacy line—the fuzzy threads that Needle Necessities called Charleston. Barbara's Needlepoint shows off the portfolio of Beth Stromberg designs they sell. Kimberly Ann has a new Marilyn Monroe make up bag! 2Bit Ranch Designs continues to come up with new designs. The charming sleeping yellow lab is new from Barefoot Needlepoint. And in case you have a naughty black lab, Barefoot has this. More hilarious cat/dog canvases from Terry Runyan at Maggie. Love the cat and birds! Here's another Bath Night in the new series from CBK. Denise DeRusha Designs has a fabulous new design called "Remember the Alamo." Sally Corey of Designing Woman has more new Mandela designs. The Wool and the Floss has a new series of Michigan lighthouse ornaments. Laura Perin has a new chart—it's sunflowers in a design she calls "Fields of Gold." Machelle Somerville has two new floral zip bag canvases. They are wonderful stitched. There are 30 new Mindy "minis," small designs with frames you can purchase separately. Mindy shares two of them here. New "Mermaid Sleeping" from Mary Tussey. The House of Embroidery has the Autumn Collection of overdyed threads. Maggie has posted more new Terry Runyon canvases on Facebook. Starke Art/CBK has a new Key West door stop canvas. Love it! But then I love Key West. Rainbow Gallery has new Entice colors—those those pinks and corals! Melissa Shirley has a new canvas from the artwork of John Johanssen, "Foxy." And More has a new series of 4 inch round alphabet ornaments. Plum Stitchery shows off new designs on Facebook. New Neon Rays+ colors are coming out in Dallas. Denise DeRusha Designs has a new travel "postcard" for Seattle. Pip and Roo has a new Christmas reindeer. Louise's Needlepoint shows off the newest book from Gone Stitching—Got Stitches Two: Size Matters. Elegant Stitch also posted about the new Gone Stitching book. Kam's Handpainted Needlepoint has a new series of Halloween-themed "bowl fillers" which are small pieces meant to be displayed during the holidays. Very creative! Labors of Love has two new small beach canvases. The starfish will be featured with a guide in the September Needle Pointers magazine. The companion turtle will also be out at Destination Dallas. Maggie has posted more new animal canvases from Terry Runyan. Rainbow Gallery shows off new colors in their Rainbow Linen thread. Sally Corey has another new Medallion design. This one is called "Contentment." Heidi Stanley Designs now has an Instagram page. Alice Peterson has a new Christmas bookshelf design. Melissa Shirley has a new flamingo piece by Vicki Sawyer. Gone Stitching has a new book out! It is called Got Stitches? Two: Size Matters and is all about what fits where. Melissa Shirley has a new Halloween books design. This is in more traditional Halloween colors than her first Halloween books design. Maggie shows off four new designs from a new artist, Terry Runyan. New S'Mores Luv canvas from My Pink Sugar Life. Here is the newest Liora Manne/CBK piece, "Mutts and Putts." Hilarious! David McCaskill has a new design called "Indian Summer," available as a download for the chart only, as a full kit with the line drawn canvas or as full instructions including how to outline your own canvas. Leigh Designs' Holiday Collection ornaments are now available! All have stitch guides by Carolyn Taggart. Your favorite shop can order the canvas and/or guide from Leigh for you. Stitch by Stitch Larchmont is posting photos of canvases you can pre-order before Destination Dallas on their Facebook page. No designers are identified. Penny MacLeod has a new cat canvas—which she is stitching, too. Maggie loves rugs and is stitching this one. A smaller version of the design will be available from Maggie in Dallas. Tapestry Tent (Liz Goodrick-Dillon) has a new peacock, available from Susan Roberts. Needlework Retailer shows off two pretty drink flasks with canvases from Viola. Melissa Shirley has shared brand new witch hat designs on Facebook. CBK has a new artist, Leslie Murray, with new designs available soon. Check out Saturday Bath Night. It cracks me up. Jody Valentine has a new series now—Harlequin Letters. Sally Corey Designs has a new medallion canvas in her series of them available in her Etsy store. Chaparral shows off some new Sandra Gilmore designs. There are new Fob Friends from Accoutrement Designs, plus re-releases and some limited editions, too. Here's a new Sandra Gilmore for Fleur de Paris called "Mail Call." Needlework Retailer shows off four new Halloween lollipops designs from Pepperberry. Kelly's posted new canvass from 2Bit Ranch Designs on Facebook! Kate Dickerson has a new artist, Megan Carn, and has posted photos of the new canvases on Facebook. Use the side arrow to see all 8 canvases. Raymond Crawford Designs has updated their Facebook page with new designs. The Needlework Retailer shows off a new Rennie Marquez from Strictly Christmas. There are other coordinating designs in this series in case you like florals with a pun. CBK just announced they are going to reproduce artwork from Will Bullas on needlepoint canvas. Puffin has a new needle minder-the USA heart. There are new colors available in size 8 metallic Painters Threads. Needle Accents has new needle minders available. These are a little different than most, so have fun browsing! Natalia Frank has a new Persian carpet chart kit ready for your stitching pleasure. Michelle at Little Bird Designs shows off her new bookmark/belt designs. JP Needlepoint has updated their website with their latest designs. BeStitched has a section of their website called "Summer Debuts" which not only has new things this summer, but shows off items that will be available soon. Items with "Coming Soon" on the photo are about to be released by Janet Gaynor/Fleur de Paris. All I can say about Purple Palm's newest series is "groovy!" Pip and Roo Needleworks has new designs. David McCaskill has a new design coming out for those who like layered stitches. It's called "Indian Summer." It should be upon David's website shortly. Suzie is dropping hints about the new Valerie Needlepoint Gallery (VNG), Scott Partridge, and Amanda Lawford designs…. I've also become a fan of Marine Devine's female portraits. She is distributed by Kate Dickerson. Kate Dickerson has new patriotic treats for summer stitching. Jody Valentine has new primary color bird/birdhouses that are darling. Whimsy and Grace has new additions to their "Fred and Ginger" series—the Bride and Groom! "Cactus Smacked Us" is a colorful cactus piece from JP Needlepoint. Check out the owl! One of these will be given away to a shop attending Destination Dallas. "Frozen Reflections" by Lorene Salt will be available in October 2018 at A Stitching Shop as either a kit or chart only. Hi Jane, This is Jane Evans...author of Threads: A Needle Necessity Editions 1 & 2. In our book, we mention that using a 4" piece of Kreinik threaded into a needle is an excellent way to pull those stray threads to the back of the canvas. Insert from the front and pull to the back. There is no damage to the canvas or other stitches. Hi, Jane! Lovely idea! Thanks very much!